Emerging technology has become a central tool for innovation and creativity in libraries. From makerspaces to media labs to the software and devices we use to do our jobs, emerging tech is everywhere and it continues to grow exponentially. It is important to not only stay up on the technology and trends, but to get comfortable and even excited about what we can do with them and how we can introduce them into our communities. That is where NEO’s Tech Lab comes in. NEO’s Tech Lab is created to come to your library and get your staff and community excited about tech. How do we do this? By teaching you what the new tech trends are with actual demonstrations of that technology, then trying that tech out yourself, hands-on! You’ll be able to explore e-Health devices, drive and code robots, play with makerspace toys, draw in 3D, experience virtual reality, and much more! Discover what tech works best for YOUR library, without having to guess. Your staff or patrons can play, explore and find the tech that fits them best! WANT TO STAY UP ON THE LATEST TECH? If you still want to keep up with the newest tech but only have a few minutes to spare, NEO’s Emerging Techbits Podcast helps libraries and communities with busy schedules keep up with the newest and most innovative technologies. From wearables to smart things to drones and more, you can learn about the newest gadgets here so that you can stay informed for your patrons and implement new tech in your library today! Feel free to subscribe to the channel so you can get notified of new podcasts. 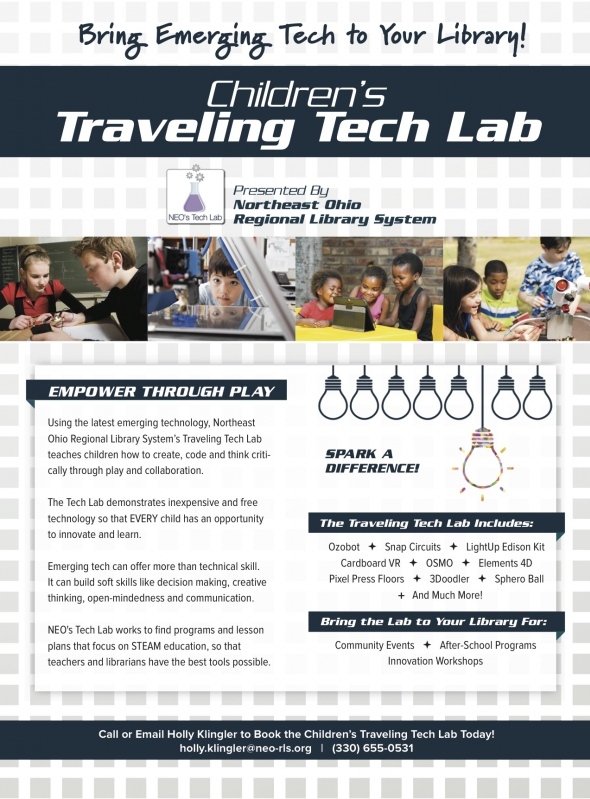 Book NEO’s Tech Lab today by emailing holly.klingler@neo-rls.org or call (330) 655-0531 and Empower Through Play! Cosmo is one of the first robots that acts just like us! He gets excited when he sees you, loves to play "Simon Says", gets a bit sad when he loses, and simply loves to explore. He can also let you see through his eyes and teach you skills like coding and math. Everyone wants to be Cozmo's friend. We are still learning about all the neat things our new friend Dash is doing! 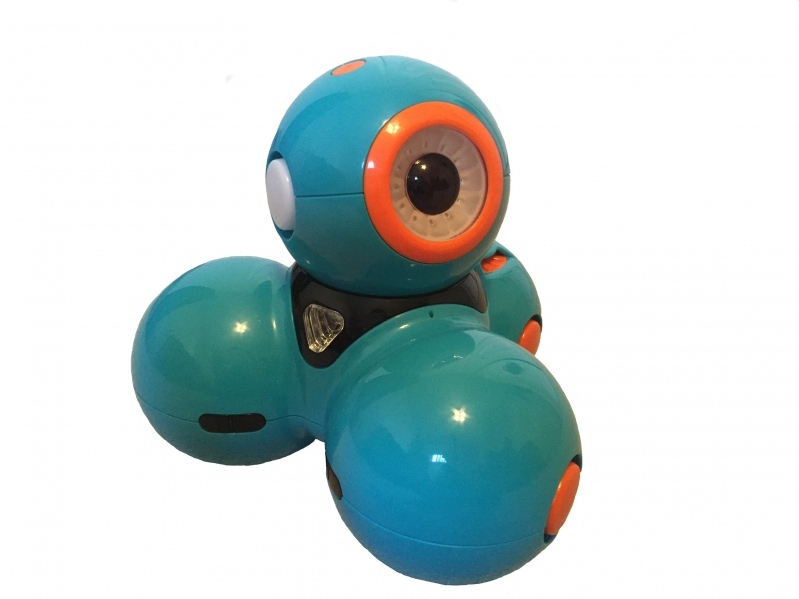 This robot is geared for younger children, but it has still mesmerized adults, (including myself!). You can use Dash to simply drive and play. You can also customize its light colors, its “eye” and what it does and says. Even more importantly, Dash can teach younger children how to code with a bunch of fun and easy apps. From riding a roller coaster to exploring the world and solar system, this virtual reality headset will make you feel like you are really there, experiencing what you see with your eyes. This is a mobile headset but it is owned by Oculus, the original and most well-known makers of VR. It is a step up from regular mobile VR because it gives you curated apps from the Oculus store. Therefore, it is as life-like as mobile VR can be! Try riding the roller coaster, your eyes (and stomach!) won't know the difference. We also have preloaded the VR headset with educational apps so that children can explore and learn about the world and beyond. The Ozobot is a small, circular robot that loves to ride on your sketches and drawings. Simply take red, blue, green or black magic markers, and the robot will follow your lines, changing the little light on its head to match your color. 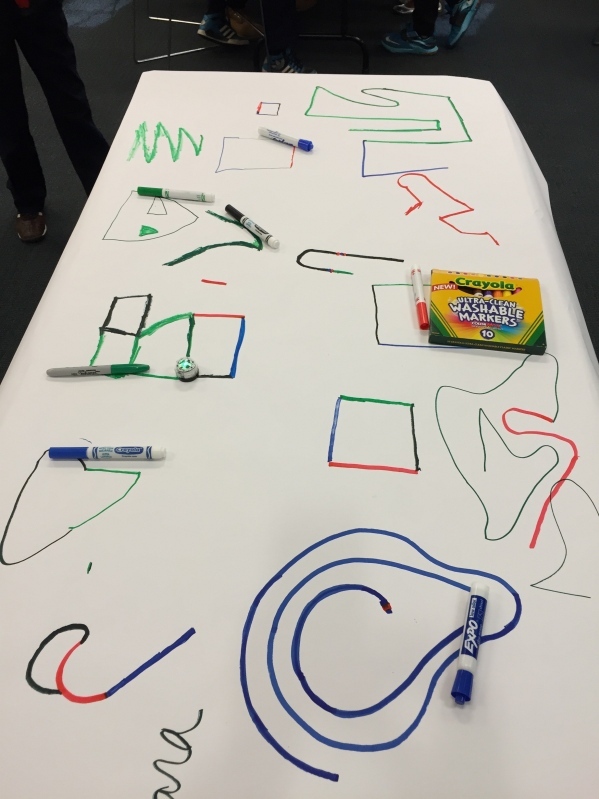 However, there’s a method to using the Ozobot above just colorful mazes and etches: you are coding the Ozobot! It comes with some rules you can follow: put a red and blue ink together, and you turn Ozobot around. If you want it to speed up, blue and black ink do the trick. Make a U-turn with a blue-red-blue combo. It’s that easy! Kids simply think they are playing with the Ozobot, but after they draw, test and see their drawings have purpose, you tell them that they just programmed a robot. This is perfect for STEAM-centered projects and programs. Book the Tech Lab to see how your youth like the Ozobot! Book the Tech Lab for Your Youth Programs! Bring new and emerging technology to your library for your youth to play and explore! Book the Tech Lab for summer kids’ programs, after school programs, makerspace faires, community events and more. With the Tech Lab, your library can determine what tech your community likes best before you buy. Many of these gadgets also come with discounts and lesson plans, so that you can easily and effectively integrate many emerging tech into your department! The technology in our Tech Lab is not just fun, it focuses on STEAM learning as well as building soft-skills like critical thinking, decision-making, creativity and communication. Book the Tech Lab for your youth community and Empower Through Play! Withings Blood Pressure Cuff—Bluetooth blood pressure monitor. Paired through Bluetooth, documented in the Withings app. After downloading the app and pairing ?the cuff via Bluetooth, it will pump and read your blood pressure for you. Jawbone UP24—bracelet that tracks your steps and sleep (deep vs. light sleep), using the UP app, which is a beautiful app! Moto 360-first highly anticipated watch because it is round and looks less like tech and more like a watch. Uses Android Wear and Google Now. You can get your phone’s notifications, email, direction navigation, alarms, step activity, heart rate and more. Samsung Gear Live—Same as the Moto 360, but of the first officially released smart watches with Android Wear, Android’s operating system for all of their wearable tech. SmartThings—Home automation, funded successfully by Kickstarter. They are wireless sensors and outlets that send information to their app (via the hub). It can tell you if a door or window opens up (using the multisensory), if a light is on (using their outlet) or if there is motion or activity (using a motion sensor). NFC (Near Field Communication) Tags—small adhesive strips with little passive chips in them. You can program them to perform small tasks for any NFC enabled phone that taps it. Using a free NFC program app, you decide what task you want to program on the chip (turn my phone on vibrate when I tap the tag, go to this website when I tap the tag, open this app when I tap the tag). Once it is programmed (you send the command program to it by tapping it as well), then whenever you tap that tag, it will perform that command. Snap Circuits—Light version: Similar to Legos, but teaches children and adults about electricity. 182 possible projects for Snap Circuits Lights. Raspberry Pi—Small and inexpensive computer made for teaching coding skills. It looks like a simple circuit, but if you plug it into an HDTV monitor, plug in a keyboard and mouse into the attached USB ports, and have an SD card, you can download and use the Python OS to do just about anything! Go to raspberrypi.org for more information. Sphero Ball—Robotic ball driven by the downloaded app and your device’s Bluetooth for fun or teaching coding and math skills. Augmented reality (AR) is simply layering digital information on top of real information. Seeing the “1st Down” lines on a TV football game is an example of AR. It’s not there in reality, but that digital information is layered on top of it. AR is used for many things, from information to fun activities. Colar Mix App—Download free coloring pages (colarapp.com) and see them come to life. To see all coloring pages, you must download the paid app at 2.99. Mini Drone—Not just for military, but drones have many uses now, including taking hard-to-reach video and becoming a convenient delivery system (Amazon is hoping to launch [pun intended] their Drone program, flying products to Prime users soon). This one won’t be carrying heavy books anytime soon, but it is equipped with an HD camera (SD card needed), and can fly to over 100ft using the associated controller. It is not easy to fly, though, and takes great practice. Be careful, the blades, though seemingly cheap, can do some damage when flying at high speed so fly with an experienced flyer! Google Cardboard: Google’s answer to an inexpensive virtual reality experience. Using just your phone and the cardboard, you can visit Tuscany, ride a roller coaster, go skydiving and more. Schools will soon be using Google Cardboard to go on virtual “field trips” using Google’s new program, Expeditions, so stay tuned!